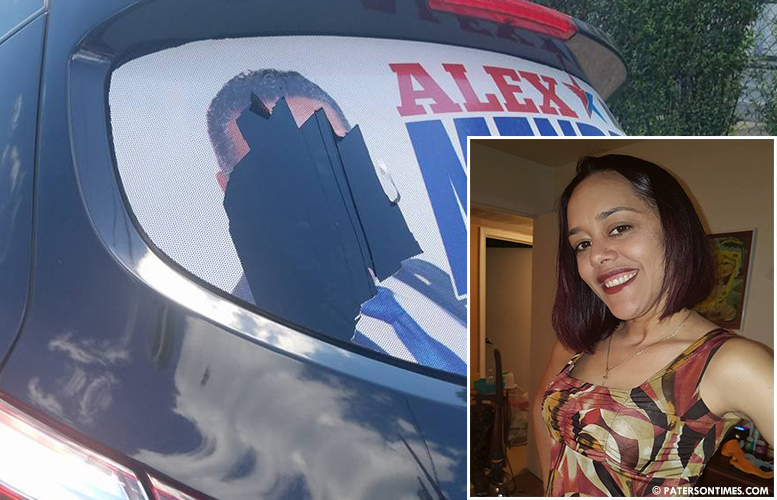 A city woman has been charged with two counts of criminal mischief for allegedly targeting councilman Alex Mendez’s supporters. Francisca Nunez, 44-year-old, is accused of slashing tires and damaging rear windshield campaign decals that promoted Mendez’s mayoral campaign. Nunez was arrested on Tuesday and charged with the fourth-degree offenses, according to police. She was identified as the actor behind the incidents by a witness, said police. Police reviewed footage of two incidents. “I’m innocent. That’s not me,” said Nunez on Wednesday morning. Her lawyer advised her not to comment on the case, she said. Nunez has been a regular at the city council meetings in recent months. She was given a citation by councilman Luis Velez in recognition of her community minded late husband, Luis Nunez. She was present at Tuesday night’s city council meeting. “She got arrested? This is news for me. I didn’t know about it,” said Velez on Wednesday morning when told of the charges. He was surprised to learned she was arrested for allegedly vandalizing campaign decals and slashing tires. Velez has been the victim of vandalism in the past when the glass of his campaign headquarter was smashed. Some have suggested Nunez is tied to former school board member Pedro Rodriguez’s mayoral campaign. 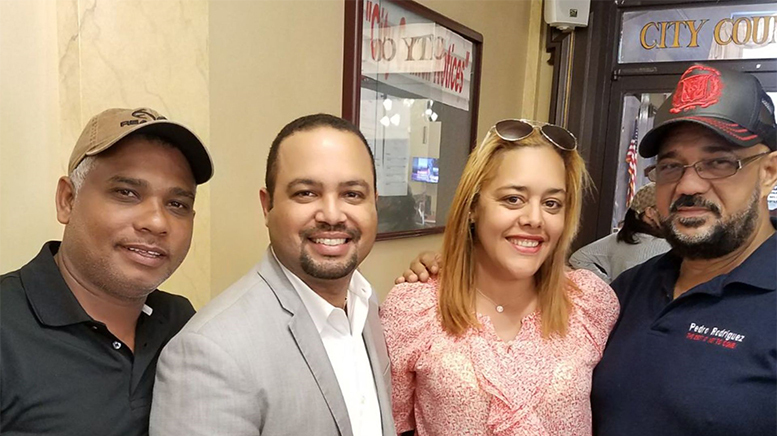 When asked if Nunez is connected to his campaign, Rodriguez did not recognize her name. When provided a picture of Nunez, Rodriguez said she is known by her nick name: “La Flaca” translated as ‘The skinny girl.” Indeed, others in the Spanish speaking community had difficulty recognizing her name, but readily identified her by photographs. 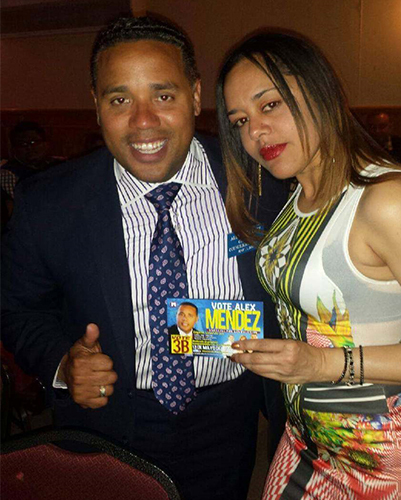 Nunez pictured promoting Mendez’s candidacy. “She’s not part of my campaign,” said Rodriguez. He said Nunez is extremely active in the local political scene. She has a Spanish language radio program, he said. “She’s working with Pedro Rodriguez’s campaign,” asserted Mendez on Wednesday afternoon. He provided an image of Nunez posing with Rodriguez’s team outside the council chambers from “few weeks” ago. He said the image provided by Rodriguez of him and Nunez is from 2013. “They are lying,” said Mendez. He is known for liberally taking pictures with others. The image Rodriguez provided is from a function that was hosted when Mendez was running for an at-large seat. Rodriguez and others said she does not come across as someone who would slash tires and damage political rear windshield clings. His own campaign has been the target of similar vandalism. Supporters have found their rear windshield decals promoting Rodriguez’s mayoral campaign damaged. Nunez has supported Mendez in the past as evidenced by a photograph of her endorsing his candidacy, according to Rodriguez. Mendez said that image was one of many photographs he has taken with residents over the years. She has also attended fundraisers held by Rodriguez’s campaign, according to political observers. Mendez said Nunez endorsed Rodriguez on her radio program. Mendez last week said five vehicles belonging to his supporters were damaged on Saturday, Aug. 5, 2017 in different parts of the city. He said seven vehicles were damaged on Wednesday afternoon. He walked into the police station and reported the incidents. He released a video on social media that shows a man in the driver seat of a gold color Lexus SUV and a woman in the passenger seat. The video footage shows the woman exiting the vehicle and stabbing the tires of a parked car. “She’s not doing this on her own. It was well planned. There’s more people behind this plan,” said Mendez. He hopes police will conduct a thorough investigation into the case. He said the acts of vandalism has scared some of his supporters. “My supporters are afraid for their lives,” said Mendez. “We will not tolerate the destruction of people’s property for any reason,” said police director Jerry Speziale on Wednesday morning. This report was updated at 7:43 p.m.